While you obviously want to get your mum a lovely card for Mother’s Day, and maybe a bunch of flowers. What else could you get that’s a bit classy and a bit different? Many of the illustrators who design cards for Flamingo Paperie have their designs on other products too. Thought I’d take a look and see if I could put together some ideas for mum that are perhaps a bit different but still lovely. Where better to start than on Etsy. 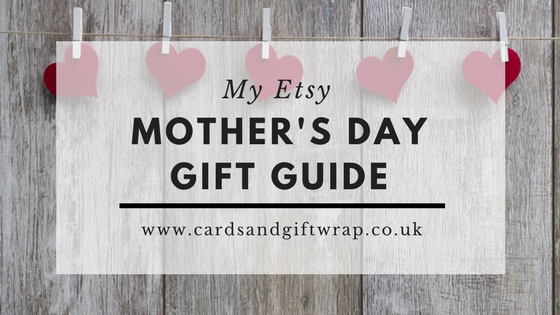 Here is my Mother’s Day Etsy Gift Guide! When you appreciate beautiful illustrations but perhaps can’t afford the original artwork then here are my next best things. Does your mother like to bake? Does she like to stitch? Does she like watching the Great British Bake Off? Does she appreciate good artwork? If so, then how about a cross stitch kit. You could either buy it yourself, complete the kit and give a picture. Or if she likes cross stitch herself then give her the kit as a present. Amanda Loverseed is well known for her cut thru illustrations as well as her other artwork. The cut thru bakery is a favourite of mine. The Dinky Cottage is quite sweet too. You can never have too many cushions! Sarah Summers does the most exquisite illustrations and many of them have been put on to fabrics. You will possibly recognise her winter and Christmas designs first but she has many others. This beautiful ‘Charcoal Birdhouses and Watering Cans‘ design would make a beautiful cushion or could be used in quilting. Maybe it’s just my mum but she has a thing about coasters! She also has a thing about fish and chips so these Mr and Mrs Fish coasters would tick both those boxes. And if you’d rather have more traditional floral coasters then these are beautiful. Of course if you’re getting coasters then you need the mug to go with it and this one, made in Cornwall of a Cornish scene would brighten up any kitchen. Is your mum ‘Pretty in Pink‘? How about some flowers that will last forever in a limited edition print. When you can’t afford the original artwork but want something a little bit exclusive then this is a good idea. Alison has a number of limited edition floral prints for sale in her Etsy shop. Any of them would make a great Mother’s Day gift but this one stood out for me. …and if you can afford the original artwork then this one is a must. ‘Fresh Daisies‘ is one of my favourite illustrations that Alison has painted. It’s also a Flamingo Paperie greetings card but I would LOVE to have this original artwork. So now you’re all set. You’ve got the cushions, the coasters, the mug and the flowers. Mum can sit and relax with a cuppa while doing her cross stitch or admiring the one you spent months making her! She is one way or other surrounded by the most exquisite artwork and now feeling very loved. I hope you like my Mother’s Day Etsy gift guide. If you know of other Etsy shops that feature Flamingo artists that I haven’t mentioned do let me know. You can leave a note in the comments below.